Visiting Punakaiki at high tide is always an exciting prospect. The area is also known as Pancake Rocks due to the layers of limestone eroded over centuries of exposure to the pounding ocean. Waves from the open sea crash through into Devils Basin, the main large inlet, and pound the rocks, from which natural vents and blow holes lead to the surface many hundreds of metres away. On a mild day it is exciting, but when a strong northerly swell and high tide combine it is terrifying, with the pounding boom of waves followed moments later by jets of sea spray flying ten metres into the air. Castlepoint is only a two hour drive from Wellington (vaguely in the direction of the seals, but North a bit) and features a lovely swimming beach, a large reef with a light house and an inlet known by local surfers as The Gap. But it was the gap in the reef that makes the most interesting sounds, as the very deep & dangerous open sea rises and falls off the reef, waves surge through the gap and spill into the lagoon. Another location nearby in Matakona was also recorded for great wave breaks on to rocks – both locations are only safe to access at low tide, especially the reef which is notoriously treacherous. Muriwai is a vast, open West Coast beach one hours drive from Auckland, but there is one rocky outcrop which at high tide is lethal. 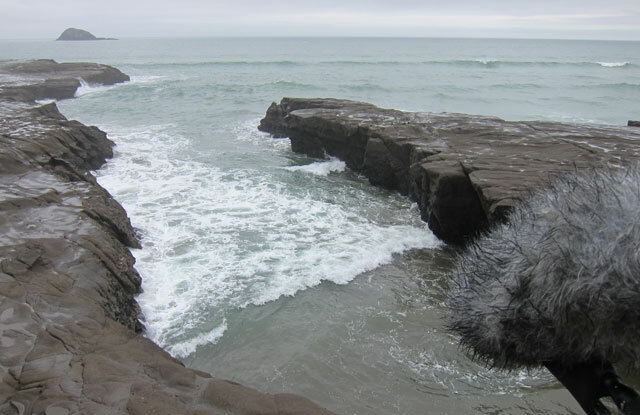 Apart from recording sets of waves surging into the gap blasting spray onto the rocks I also discovered that by pointing one of my mics down into a crack in the rocks, an almost subterranean perspective was heard, almost like a mini blow-hole.